Don’t Be Fooled by Cuadrilla’s Choice of Words in this Planning Application Thirty years is a long time. This is the length of the lease Cuadrilla has at Lower Stumble. 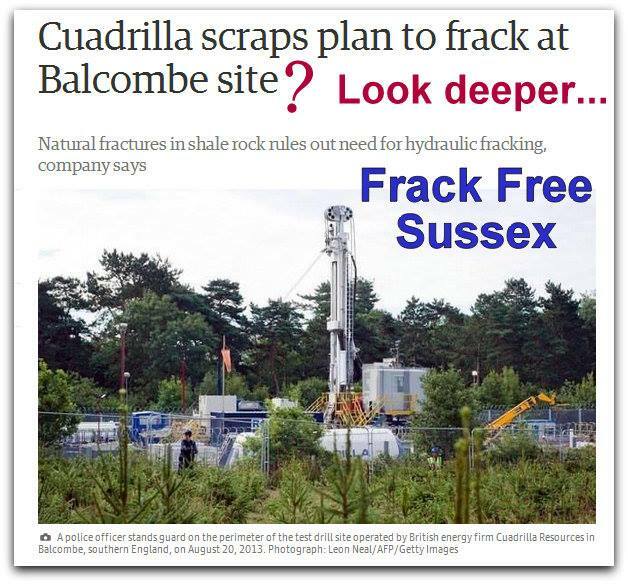 Cuadrilla are very keen to stress to us and the press that they are not “fracking” in Balcombe. However, they fail to explain to us what their definition of fracking is. This is Planning Application Number Two in a thirty year strategy that will no doubt see many more applications made in the Balcombe area. Cuadrilla has a PEDL (Petroleum and Development License) for a large area of Sussex. Other areas in Balcombe may become targets in the near future. Unfortunately the High Weald is perched on a rich bed of hydro-carbons; oil and gas. Cuadrilla is an exploration company not a production company and so it is likely that they will sell their development and production rights to another company allowing them to say “we, Cuadrilla, have no intention to frack”. For example in Lincolnshire, IGas will serve as the project's initial operator, but Total will take over as the project moves closer to development mode. The way planning works in the UK is that each application is taken separately without consideration of long term likely plans. This encourages the “planning game” where applications are made piece by piece. We should at this stage expect Cuadrilla to say whatever is necessary to get permission for their next step (and of course never mention the “f” word). Vanessa Vine of Frack Free Sussex, who lives four miles from the site, told the Guardian many people were still highly concerned, and that the difficulty of defining fracking meant that some of the technologies that are still likely to be used at the site amounted to fracking by other terms. She said: "This unconventional fossil fuel technology is damaging to communities, human health and wild ecology at every turn. The impact on road infrastructure will be a nightmare and – if allowed to continue to production stage – the methane flaring will emit dangerous particulates into the air that will adversely affect people living nearby and the methane leakage will contribute dreadfully to greenhouse emissions." She vowed to continue to fight the plans: "If permission is given for Cuadrilla to recommence operation in Balcombe, their shareholders will come to regret it bitterly and wish they had invested wholly in safe renewable energy technologies instead. People have had enough of being lied to and told that international frack dealers have our communities' best interests at heart."